All field service management software does the same thing, right? While this might be true for some software programs, 360e field service management software is different. It has all the features you wish this type of software included and none of the ones you don’t need. This is because our developers are contractors themselves. We are not a shared solution, which means you have flexibility in user access and features. Scalable Costs: Affordability is one of 360e’s core values, and we’re committed to making the software cost-effective for companies of all sizes, including startups and shops with one or two workers. When you use 360e, you only pay for what you need. No per-user costs: Most types of field service management software operate on a per-user cost model. This means that you pay for every user that you add to the system. That is unfortunate, because as your business grows and you hire more employees, the cost to use the software also increases. We will also not surprise you with additional charges, hidden costs and user license fees. Adding new users is simple: With many software programs, adding a new user doesn’t just cost you more money, it involves a lot of red tape. You must first contact the software company and wait for an account authorization, account setup and more. With 360e, all you have to do is go to the Control Center to add new employees and administrators. Simply enter the user profile and hit “Save.” No worrying about extra fees, no headaches. Control permissions: You have complete control over the data and parts of the system that employees can access, as well as the information they can alter. When an employee leaves the company, you simply deactivate or cancel the user’s account from the Control Center so he or she can no longer access the program. When you have direct control over permissions, you have greater security over your data and your customers have greater privacy. No sharing: Most software programs are mass-marketed, prepackaged bundles with some features you need and many that you don’t. You will never compete with hundreds of other companies using your software, bogging it down and potentially crashing it. Your software is your software with 360e. 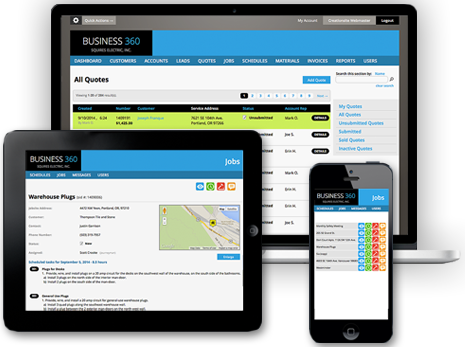 Web-based: 360e is web-based software that you can access from any device that connects to the internet, including computers, laptops, smartphones and tablets. You and your workers never have to wait to return to the office to complete tasks on a computer. Take care of business at any time of day by logging on from the office, field or anywhere in between. Don’t pay for upgrades: Because 360e is web-based, you will always have access the latest version. Say, “Goodbye,” to waiting for updates to download and install. 360e grows with you: As your business grows, you might need your field service software to perform additional functions. With 360e, this is no problem. Simply tell us about the features you want to add and continue using the familiar interface that you enjoy. Business process development: If you feel as if your contracting business could perform better, we understand that a software solution might not be the only answer. For this reason, we offer consulting services that deliver results. Our experienced consultants will work with you to help improve business processes, organizational development and team building efforts. They can also help you with productivity and efficiency assessments, developing growth strategies and more. 360e allows you to manage all of your business’ operations—from scheduling technicians to viewing inventory to creating quotes—using a single software program. It’s designed by contractors for contractors to give you a system that’s intuitive, easy to use and effective. It’s time to stop letting software be a source of headaches and start using a program that is not just a pleasure to use, but can also increase your profit margins. Schedule your complimentary 360e demonstration today.